The separate FX rack opens up a world of possibilities, from adding just a touch of warmth with the amp simulator to advanced sound design with chained multi-effects. 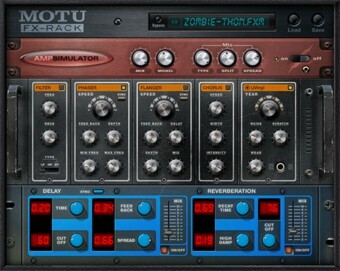 Click the FX button to open the FX-Rack, which is a separate window with eight effects that can be applied individually or in combination as a multi-effect to any preset. Since effects can be loaded, created and saved independently of instrument presets, it's easy to mix and match effects with presets, allowing you to experiment with practically infinite combinations. Choose from dozens of included presets, or create and save your own. Quickly navigate the browser with your mouse or computer keyboard. All effects parameters can be automated or modulated with one-click "MIDI Learn" CC assignments. 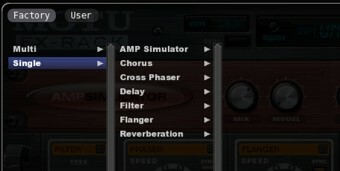 Control every parameter from your MIDI controller or sequencer, including bypass of individual FX or the entire FX Rack.